Red_Dot - Brian Enos's Forums... Maku mozo! Shooting, building stuff, modifying anything to make it faster. Polymer Guide rod is the easiest half oz to shave if you haven’t yet. Thank you both!! Excellent info! I've been doing some thinking around the concept of reciprocating mass and center of gravity of that reciprocating mass. I am an engineer with machining experience so this sorta stuff is fascinating to me, but I don't have enough real world experience tinkering and testing with firearms to know if any of it really matters. My question is really 2-fold. 1) Knowing that [Force = Mass * Velocity^2], by reducing the mass of the slide by ~10% and making adjustments to the recoil spring to keep ejection distance appropriate, is there a tangible difference in recoil of a pistol with just slide lightening? 2) If said slight lightening also lowers the vertical center of gravity by ~10%, that should also reduce the force felt at the grip. Ultimately, what I am confirming is, taking as much weight out of the front and top of the slide as possible is theoretically the most effective at reducing felt recoil, but does the theory line up with real-life experience to those who have done it? Just for kicks, the 3D model for the slide I am playing around with is attached. It all comes down to your hand size and preferred grip IMO. i shot a Shadow2 for over a year in various configurations and thought it was nearly perfect until I picked up a Bull Shadow from CZC. the grip profile fits my hands better and the sights just return to their position effortlessly. It’s really easy to shoot it well. it does have drawbacks though. No grip checkering, standard magwell opening but I think the controls are more comfortable. it all comes down to your specific size shape and needs/wants from the pistol. That should be explicitly covered in the IDPA rules should it not? It’s become profoundly apparent that in order to build strength in one area, you must be equally as strong in the opposite motion. It’s very difficult to build strength in your biceps without equally challenging the triceps. Likewise, chest and back. There is strength in balance. No, with the CZC follower and spring I’m getting 23 in. I had to take half a coil off but it feeds reliably so far. 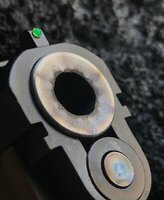 Does anyone make a smaller Shadow 2 Mag Button face? Would pivoting it 180* actually benefit you at all? I snagged the PCC takeoff on here last week and am super happy with it. I had the Taccom CF tube and it was nice but the oval shape of the PCC one just fits better IMO. i really like how close the HG sits to the bottom of the barrel. Weight distribution feels good too. Cuts provide some really nice texture to sink your hand flesh into. Another data point. Save almost a half ounce with SP01 18 round magazine with +2 extension. 15yard will show no real measurable benefit. run it out to 25 if not 50 yards to really see if you gained anything.